At MEDS Pharmacy Group, we are focused on supporting you and the unique health care needs of your family. We’d like to welcome you to our blog that will provide information and tips about every day health care, wellness, and about our expert pharmacy services. It will feature practical information that you can use to improve your habits, tailor your diet and exercise choices, learn about specific illnesses and conditions, discover medication options, and read tips about overall health prevention and maintenance. As health care professionals, we understand and want to promote that wellness and good health goes beyond prescription medications. A combination of dietary factors, exercise and activity, sleep quality, mental health care, daily routines, home and local environment, and genetics also make a big impact on your health. Understanding which factors you have control over, the reasoning behind certain decisions, and how to make changes is pivotal for your and your family’s wellbeing. Read on to learn about our services, including pharmaceutical compounding, medical fittings, and prescription filling & delivery, or visit our High Park Pharmacy and our other locations for more. Our award-winning and knowledgeable pharmacy teams have been operating for 70 years in the heart of three of Toronto’s favourite neighbourhoods: High Park, the Junction, and the Kingsway (Bloor West). Our independently-owned operations and dedication to customer care sets us apart from large chain drugstores due to our expertise in medications, our compounding services, and our availability to assist patients and shoppers. Your family is at the centre of our MEDS Pharmacy Group commitment to care. We pay attention to the things that matter to your family in your daily lives. This means checking in on you from time-to-time, assistance with prescription management, use, and renewal, and getting to know you. It’s our primary concern to inform about benefits, uses, and potential side effects to help decide what is best for yourself and your loved ones. We also feature a strong focus on customization in terms of pharmaceutical compounding options, dosing, and unique packaging to help with compliance. We want to be sure you take the right medicine at the right dose and at the right time. Although we can fill all regular prescriptions at all of our locations, we pride ourselves on also being able to customize medications within our compounding labs. Compounding medications means creating unique formulas tailored to you. It used to be that all medications were created specifically for the individual. However, large scale manufacturing came into popularity and along with it the ability for big pharmaceutical companies to grow and cut costs. These days, most brand name and generic prescription drugs come with few options, which leaves many people ingesting undesirable quantities of ingredients and experiencing too many side effects. At MEDS, we provide highly-specialized options and can tailor your medications with attributes like specific doses, leaving out undesirable components, providing medications that are no longer available, adding flavouring, changing the size or colour of pills, and altering the formula to a liquid or topical application. Taking medications can be tricky, especially for children and pets. Changing the formulation to make it easier to swallow, chew, or apply, improves everyone’s daily routines. At MEDS Canadian Compounding Pharmacy our pharmacists are specially-trained to formulate specific medications for your family, working closely with the Ontario College of Pharmacists. We use the latest equipment, techniques, and quality control measures in our lab facilities which are also regularly inspected. So, you receive safely prepared, precise, and high-quality prescriptions made from high-grade ingredients that meet or exceed quality control requirements. We only deal with major manufacturers and distributors – offering only high quality products that we can stand behind. We can submit third-party billing to WSIB for fitted garments, as well as DVA, NIHB, and Social Services. Filling prescriptions is easy. Contact us by your preferred method – phone, fax, online, or email – and we’ll take care of everything. 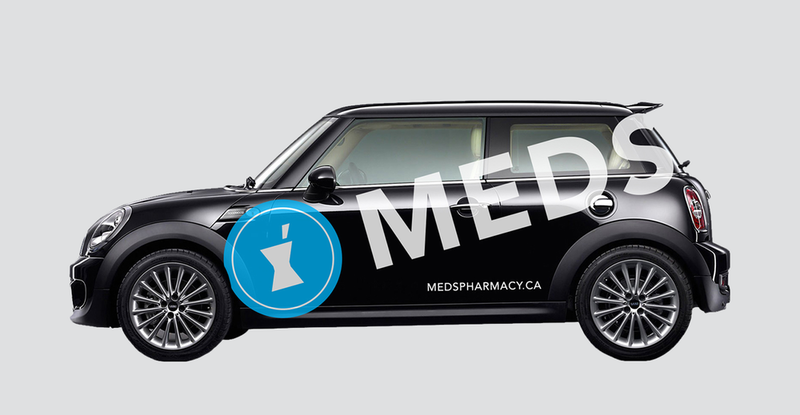 Our MEDS Pharmacy delivery services are available from each of our three locations in Bloor West, High Park, and the Junction in Toronto. We’ve streamlined our services to make them easy to use, set-up, and order refills online. If you need to transfer from another pharmacy or pick-up a one-time order for your prescription, we can fill any prescription with renewals from a licensed Canadian pharmacy. Call us or complete the simple form on our site. We can deliver anywhere in Canada, not just the GTA. Delivery times vary depending on your location, from a few hours to 1-2 days. Compounded prescriptions that need to be specially-formulated may take longer to fill. A signature is always required for delivery of your medications for safety and regulatory reasons. Many insurance companies offer reimbursement for compounded prescriptions. However, it’s good to contact them about eligibility for specific prescriptions. We can do this on your behalf to provide all the necessary information required. Depending on your provider, we may also be able to submit claims on your behalf. You can drop by our Junction Pharmacy or other locations to learn more. We also provide flu clinics, events, and classes to further support you and you loved ones’ wellbeing. Since our priority is serving you with expert, independent pharmaceutical services and products, we’re happy to hear from you and answer any questions you have about prescriptions, medical fittings, compounding, and any other health care-related queries. Contact us today.